(PRLEAP.COM) February 11, 2015 - Versatex has published their expert tips for safely cutting PVC trim board to help builders complete their projects. Offering builders the same visual appeal of wood without the hassle of maintenance and worry of weathering, more and more contractors are utilizing PVC trim board and PVC products throughout their home construction projects. Like wooden trim, PVC trim can be easily cut and installed on any home. While many of the supplies used are the same, there are a few differences that builders should take note of if they are more familiar working with wood trim. The first step before you begin cutting your trim is to take measurements of what you need. Make sure to double-check every measurement you take, ensuring that you have the right size for your project before making the cut. 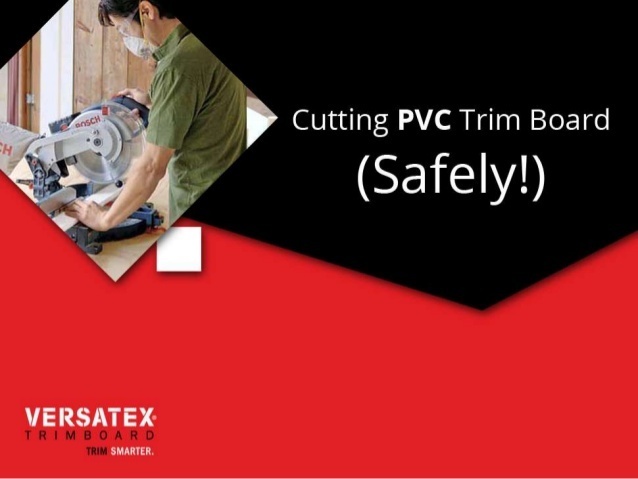 Safety should be your first priority when cutting your PVC trim. Set up your miter saw so that it sits flatly on a firm table, ensuring that your PVC trim and the saw will not move during the cutting process. Secondly, make sure you wear safety goggles and a dust mask to avoid coming into contact any dangerous dust particles that may result from the cut. Install the carbide tipped blade and slide the PVC into proper position before plugging in the saw. Once the PVC trim board is in place and the saw is plugged in, adjust the blade to the correct angle. Before turning on the saw, pull down your saw to make sure the blade's tip lines up with your measurement mark. After you are absolutely certain that the blade aligns properly with the cut you want to make, turn on the saw and slowly pull the blade down to cut through the trim. After the cut has been completed, slowly release the trigger and return the saw to its resting position. While a miter saw is recommended, it is not the only tool you can use to complete your cut. A circular, band or reciprocating saw are all acceptable methods to cut your PVC trim. Make sure to closely follow manufacturer instructions when choosing the saw best fit to the job. To get started cutting your PVC trim board to size, check out the slideshow from Versatex today by visiting http://versatex.com/blog/2015/01/slideshow-cutting-pvc-trim-board-safely. If you are looking to use PVC trim or any PVC products on your next home construction project, be sure to check out the selection of products and technical help from Versatex. The Versatex team is committed to helping their customers by providing them with long-lasting, high-quality PVC products. To learn more about how Versatex can enhance your next home construction project, please visit versatex.com.